For this showcase we return to Club Obi Wan. Check it out ! 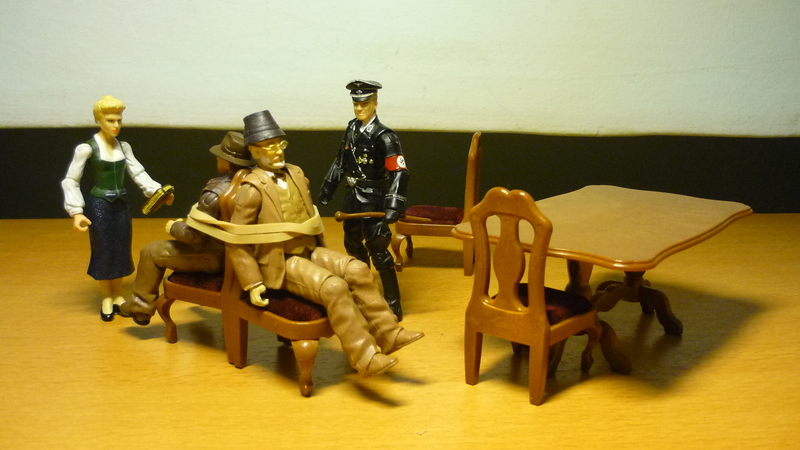 In 1935, Indiana Jones arrived in Shanghai for an artifact exchange with the crimelord Lao Che. However, the night before the exchange, Lao Che’s son, Kao Kan, paid Indy a visit in an attempt to steal the artifact. Few details exist about what exactly transpired during the encounter, which resulted in Kao Kan losing a finger on his left hand, and Indy merely saying that he had spared Kao Kan’s life. There was no question that Kao Kan was barely able to contain his anger at Indy during the artifact exchange at Club Obi Wan the following evening, a fury which finally manifested itself when, after the negotiations had broken down and a fight ensued between Indy and Lao Che’s men, Kao Kan grabbed a Tommy gun from his henchman and wantonly sprayed lead at Indy, without him paying much attention to his aiming. 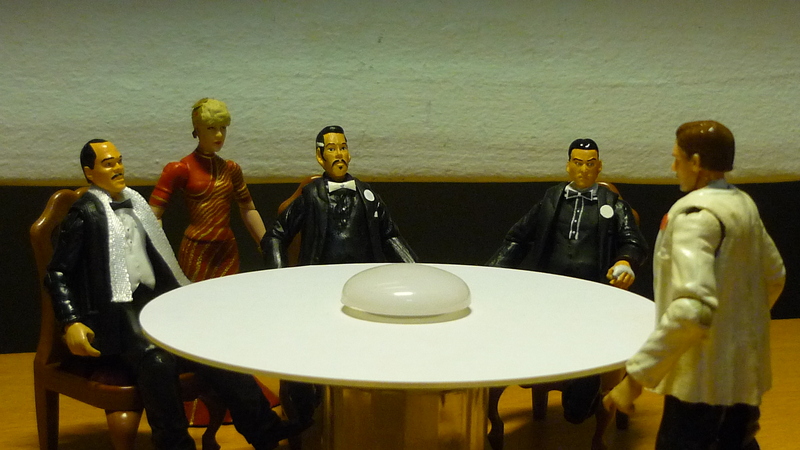 The head used for Kao Kan comes from a PLA soldier figure, which I acquired during my trip to Hong Kong. As a sidenote, the manufacturers of the PLA soldier series seem to be the same as that of the World Peacekeepers series since the PLA soldiers use the same models of weaponry, from Humvees to APCs. 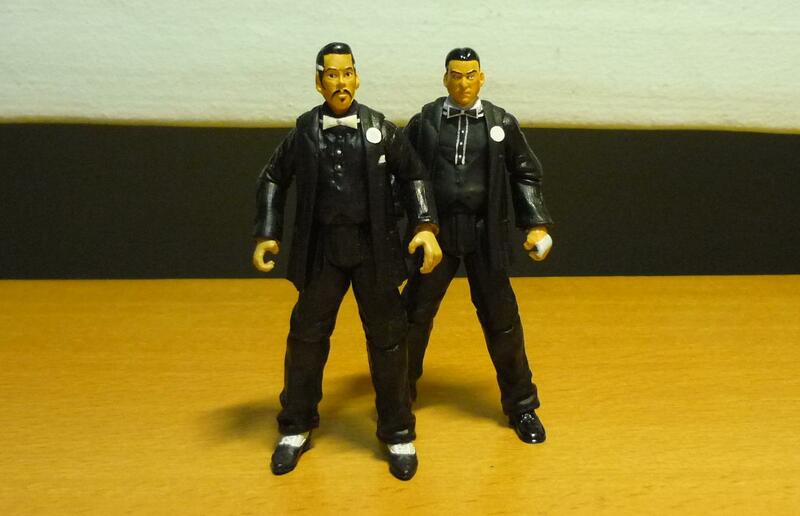 Actually, I had bought several of this figure, and the one with the most badass face was chosen. The arms were extra custom fodder from another Star Wars figure. Additional hair was sculpted on with epoxy to create a center-parting. And again true to the screen appearance, the index finger on the left hand was sliced off, with a bandage sculpted on using epoxy. Chen, another son of Lao Che, was a thin, balding man, who spoke little during Indy’s artifact exchange with Lao Che, save for uttering a few curses at Indy in his native dialect, when he thought that Indy had mocked his half-brother Kao Kan. But he proved to be quite the marksman when, without anybody noticing, he took out Indy’s sidekick Wu Han, shooting him with his pistol right at the same time when several champagne bottles were popping which disguised the sound of the gunshot. Chen was laughing at Indy’s predicament when Indy, determined to avenge Wu Han, grabbed a flaming skewer and hurled it at Chen, causing Chen to scream and die in agony. You didn’t recognise Mace Windu, did you? His bald head made it perfect for painting the balding hairline, and with the mustache painted on he looks exactly like Chen. 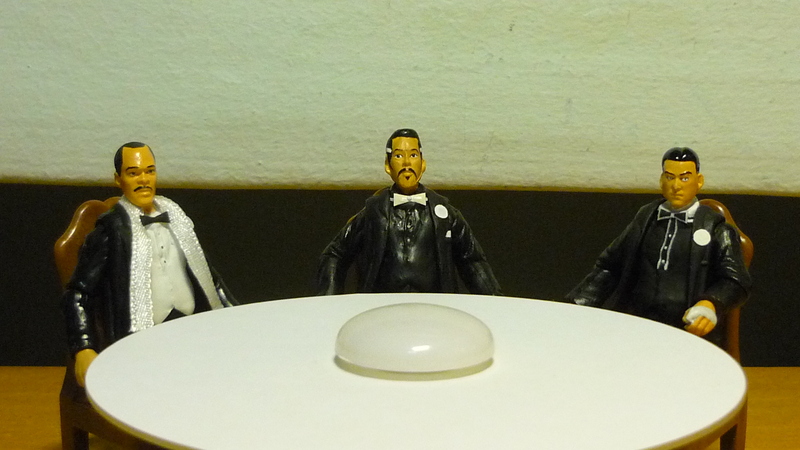 There’s another reason why I used Mace Windu’s head for this figure. 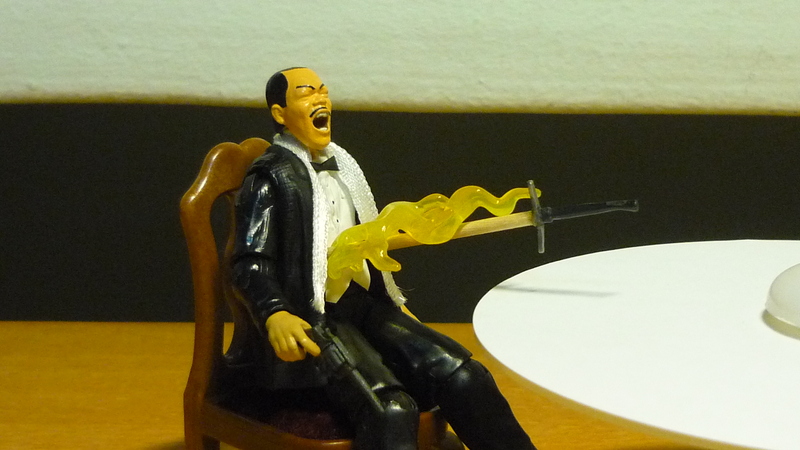 There so happened to be another Windu figure with him screaming, and I was inspired to create an alternate head for Chen, for reasons that will soon become obvious. Chen’s arms come from a ROTJ Luke Skywalker, the arms already have black long sleeves, so I saved myself the trouble of painting the colour and having to deal with sticky arms (The acrylic colours, even when dried, are always a bit sticky). Also, flat black seems to grow moldy quite easily, and I’ve avoided this for the arms. A piece of white ribbon serves as Chen’s scarf. Lao Che and his sons await for Indy’s arrival. Lao Che introduces Indiana Jones to Willie Scott. Indy avenges Wu Han by killing Chen with a flaming skewer. Lao Che and Kao Kan look on as Indy makes his getaway at Nang Tao Airport. Unknown to Indy, the plane belonged to Lao Che’s consortium, and Lao Che, who had just lost one of his sons moments ago, was instead rather happy as he knows that he can radio instructions to the pilots to exact his revenge on Indy. N.B. The Indiana Jones novel “Indiana Jones and the Dinosaur Eggs” has a reference to a third son of Lao Che, who was decribed as a fat man and also in the gangster business. Following up on my previous custom weapon (which was Kazim’s machine gun), I have made another weapon for one of my upcoming custom Indiana Jones figure. I present to you : the Thompson Submachine Gun! Or as it is more infamously known as the Tommy Gun! 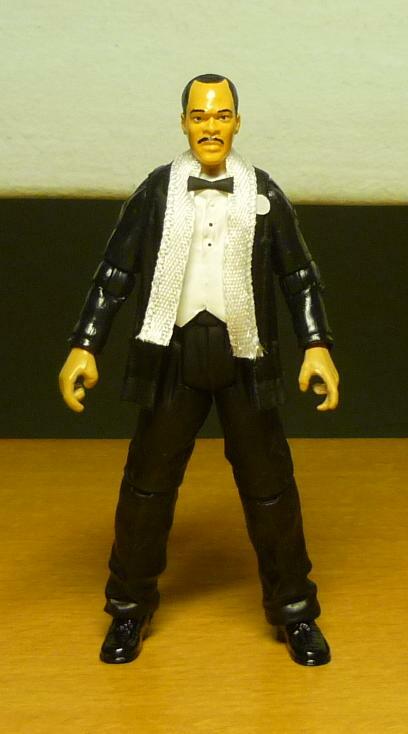 My original plan was to search on eBay for a 1:18 scale Tommy gun for use as an accessory to my figure (Kudos if you can already figure out who he is! ), but after seeing only a handfull of listings and that some of them were on sale at exorbitant prices, I decided, what the hell. I can make the weapon myself, after all I had already made Kazim’s machine gun previously. 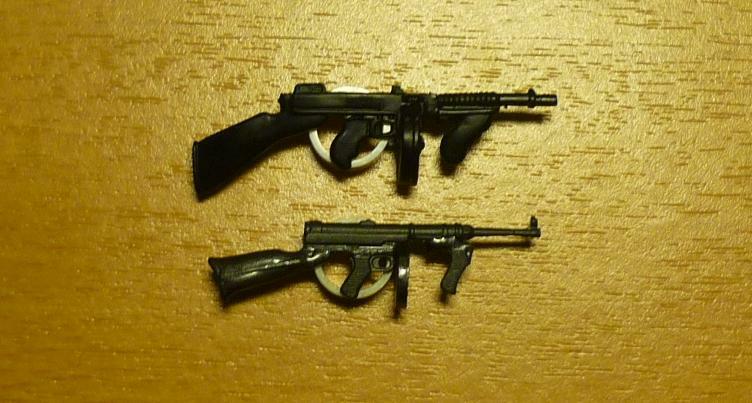 Similar to Kazim’s machine gun, the Tommy gun (top) was modified from a MP40 with extended stock (bottom), which came with the German Soldiers deluxe set. Some parts of the original gun were either sliced off or rearranged. The stock was created by pasting pieces of toothpicks as filler, and then sculpting over with epoxy. 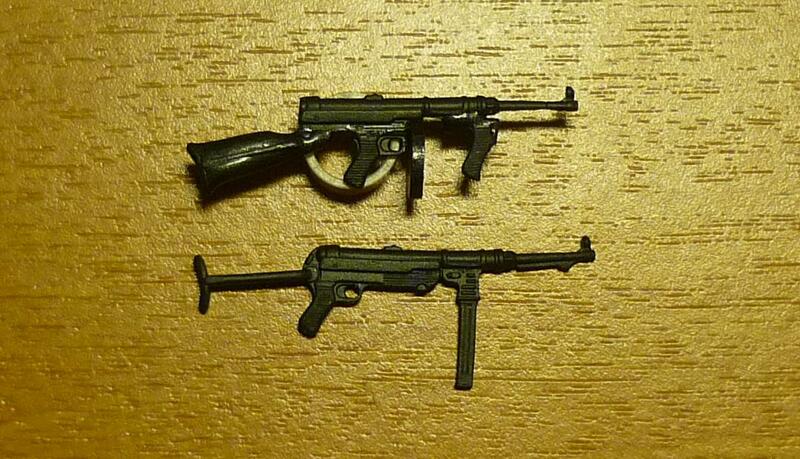 An additional handle from another MP40 was transplanted over to serve as the front handle. 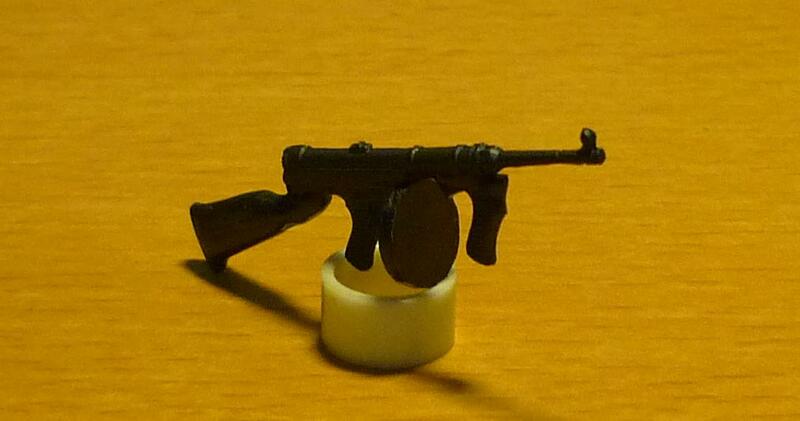 And a round piece of plastic was cut out and pasted onto the gun to serve as the drum barrel. 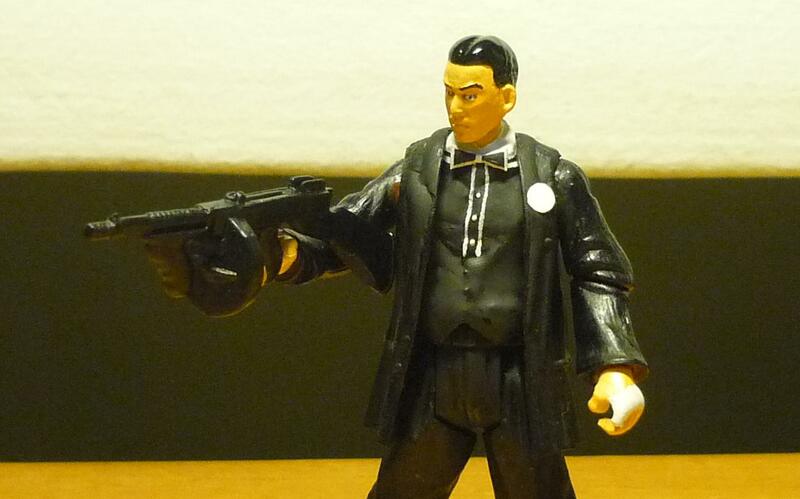 Gun metal was painted over the epoxy and plastic to give the Tommy gun a metallic finish. 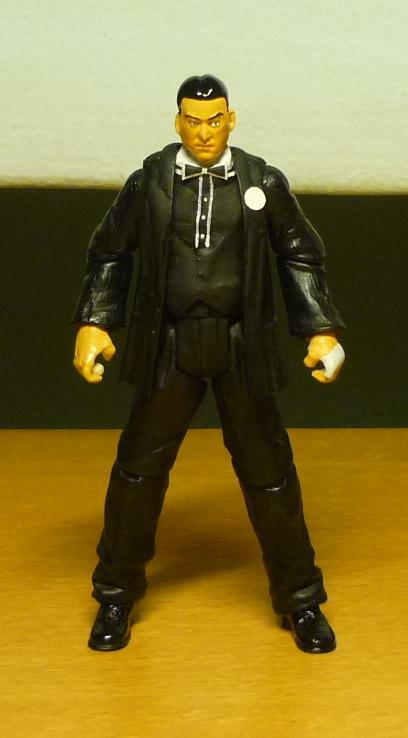 … And it was shortly after I had completed my Tommy gun when it was announced that Hasbro was going to make Bucky, a Marvel Universe character. 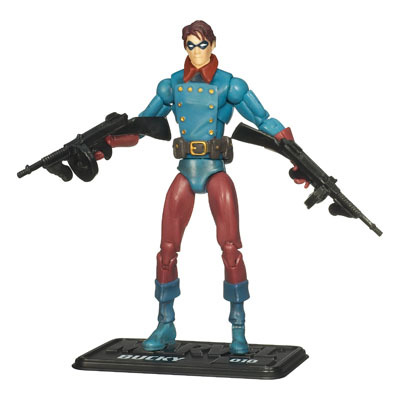 And Bucky comes with… two Tommy guns! Let’s just say that I was damned pissed at having gone through all the trouble of creating the 1:18 scale Tommy gun, when only a few months later I could have easily bought the Tommy gun at the local department store. Here’s a combo showcase, and with good reason too! 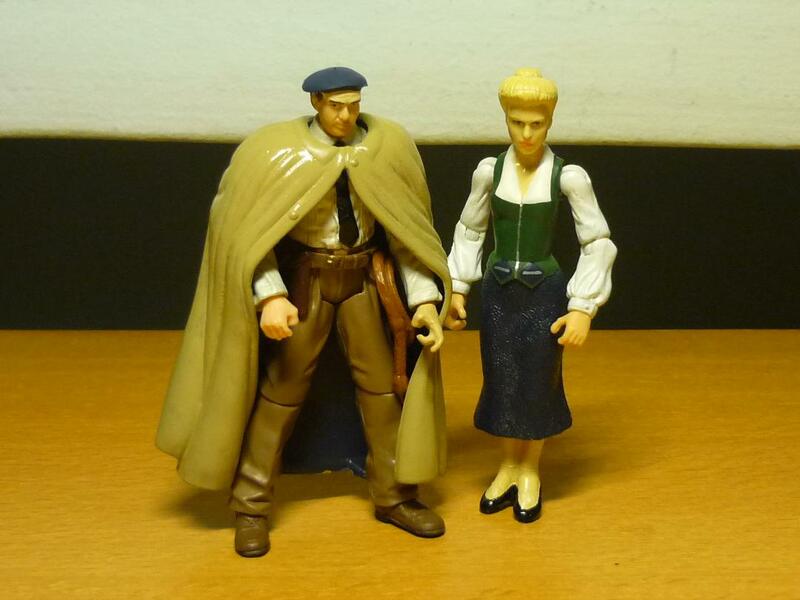 Indiana Jones and Elsa had arrived at Brunwald Castle, and Indy needed to find a way to infiltrate into the castle in order to rescue his father. Indy therefore disguised himself as a Scottish Lord and tried to pass himself off as “Lord Clarence McDonald” who had come to visit Brunwald Castle with his lovely assistant (Elsa) to view the tapestries. However, when the butler appeared less than convinced of Indy’s supposed identity, Indy then said goodbye to the butler in the German manner by punching the butler in the face and knocking him out. 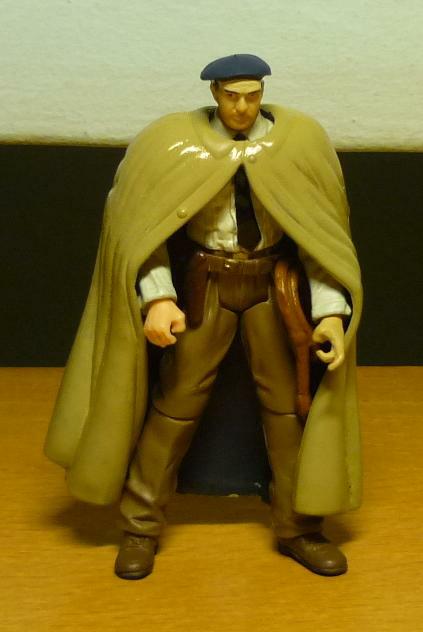 While scouting around the toy flea markets, I’m always on the lookout for loose figures which I could possibly use as custom fodder, and it so happened that when I saw the Star Wars Garindan figure with his cloak, I had a sudden brainstorm and it became obvious to me which Indiana Jones figure I can customise next. Although that cloak needed to be modified slightly to better match its onscreen appearance. Epoxy was used to sculpt additional collars and buttons. And Scottish Lord Indy wears a beret, which was created by first slicing off Indy’s fedora, then pasting a round piece of paper to use as a base, the beret was sculpted on using epoxy. Actually, the figure does not look very convincing to me, which doesn’t really matter since no one in the movie was convinced by the Scottish Lord getup. Who was he trying to kid? Indy had just freed his dad from his prison, and he went to get Elsa, only to find Elsa being held hostage by Colonel Vogel. When Vogel threatened to shoot Elsa unless Indy surrendered his weapon, the smittened Indy was unwilling to risk any harm to fall onto Elsa and he tossed away his machine gun (and breaking a couple of glass bottles in the process). Vogel then released Elsa into Indy’s arms, whereby Elsa revealed her true allegiance by stealing away Henry Jones Sr.’s grail diary from Indy’s jacket. Indy later learns that his dad had also similarly been smittened by Elsa, albeit earlier. 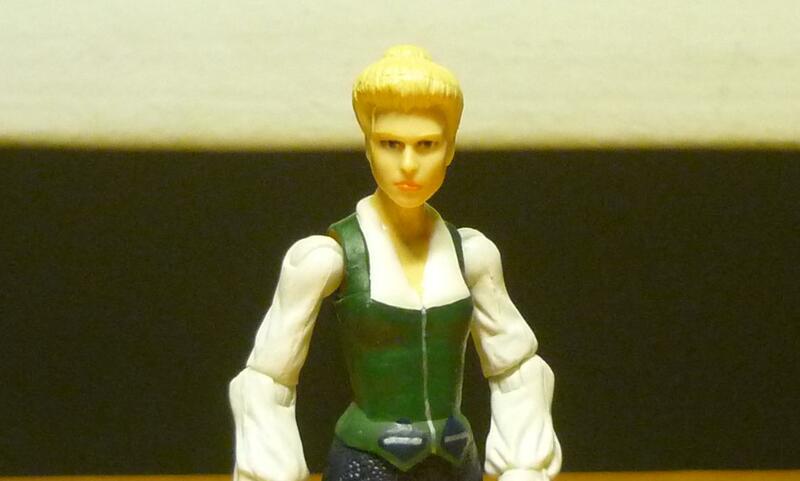 Well, considering that I had already customised variants for the lead female characters in the two preceding Indiana Jones movies, I’d thought it’s time to make a variant Elsa, and I have chosen to make a custom Elsa based on her appearance during the Brunwald Castle scenes. From my experience with female figures I had a good idea of which parts I needed to do the custom, namely Padme Amidala (again! ), which is a favorite amongst customisers thanks to her female form. Her dress was trimmed to match Elsa’s, Elsa’s head and arms were transplanted over, and epoxy was used to sculpt the collars and vest flaps. 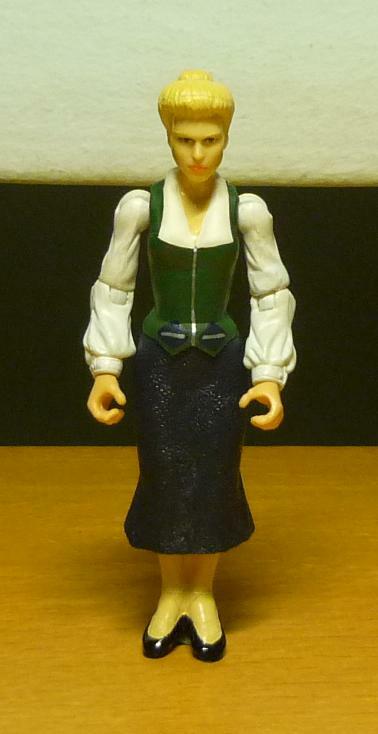 The Elsa figure was wearing black gloves, so a pair of female hands was transplanted over to her, and those hands came from Marion (which was a rather apt choice, I think). Indy and Elsa masquerading as Scottish Lord with assistant.